The band's career is charted in the warts-and-all film Playboys Of The Western World which will be launched with a premiere screening at the Royal Albert Hall in London next month. And the group - who topped the charts with True and had major hits during the 1980s with Gold and Only When You Leave - will also play some of their best-known tracks at the launch on September 30. The launch, including a question and answer session hosted by broadcaster Lauren Laverne, will be broadcast by satellite to cinemas across the UK and Ireland. It marks the quintet's return to the Albert Hall for the first time since True was released in April 1983. 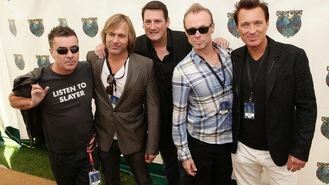 Director George Hencken has pieced the film together with archive footage, together with interviews with band members Tony Hadley, brothers Gary and Martin Kemp, Steve Norman and Jon Keeble. Tickets for the event go on sale at 9am on Tuesday.